Learn how to make this season’s hottest bar snack right at home. 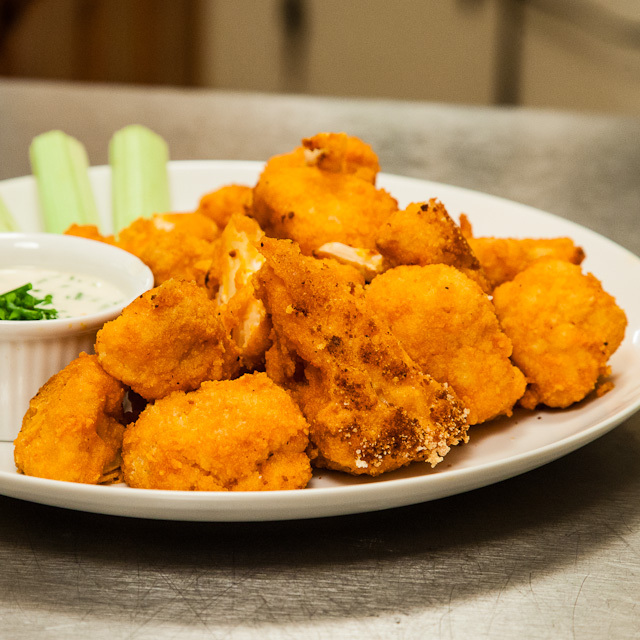 It’s no secret that buffalo cauliflower is all the rage right now. I’ve had it at Sage Organic Bistro and Mohawk Bend here in LA. I’ve even spotted it at a food truck in St. Louis on our recent cross country move. Needless to say, this dish is dropping it like it’s HOT. But I don’t always feel like putting on pants and dishing out dough just to eat good food. So I thought I’d try my hand at making it at home. Not only is it fairly quick and simple to whip up a batch of these bad boys in your very own kitchen, this version is also #bakednotfried, which makes for a lighter dinner experience all together. Pair it with some vegan ranch to cut some of the heat and don’t forget a cold one to wash it down. Chop the cauliflower into bite sized pieces. You can use the florets, the stalk and the greens. It all will taste great breaded and baked! Set up two bowls: one with the flour, one with the milk. Fill a sealable tupperware container with the breadcrumbs. Dunk your cauliflower pieces into the flour, then into the milk, then place them in the breadcrumbs, seal the lid and give it a good shake until they are completely coated. Spread coated pieces out on a parchment lined baking sheet. Bake the breaded cauliflower for 30 minutes, flipping halfway through. While it’s baking, make the buffalo sauce by melting the vegan butter in a small saucepan over medium low heat. Then add in the hot sauce, apple cider vinegar, garlic powder, salt and pepper. Stir and let simmer over low heat until all ingredients are dissolved and the sauce starts to bubble around the edges (this should only take a few minutes). Pour half of the sauce into a large bowl, followed by the crispy cauliflower pieces, then drizzle the remaining sauce on top. Toss with tongs until the cauliflower is completely coated in sauce, then spread the coated pieces back out on the parchment lined baking sheet. Bake for an additional 5-8 minutes, when you’ll see the sauce starting to brown, dry out and cling to the cauliflower.